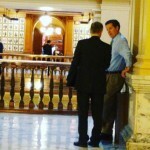 Home » Posts Tagged "Greg Smith"
Gov Brownback outside today’s Senate hearing on SB 469 attempt to strip teachers of more rights. Jeff Melcher, the man who has fought to completely eliminate collective bargaining and other rights for teachers continued his war today with his bill intended to end teacher representation. SB 469 would require that every teachers’ association would be subject to a recertification vote annually; that an organization would need 50% + 1 of eligible voters (not votes cast) to be certified; would force the teachers to pay for state mandated elections; and would ban teacher representation for three years if the Department of Labor failed to hold an election. Make no mistake, the intent of this bill is to end professional representation for teachers and leave them as at-will indentured labor. Why would legislators like Melcher, Pilcher-Cook, and Lynn want to destroy the teachers’ association? Because it is the only thing that stands between their corporate masters’ desire to turn public schools into profit centers and the right of every child to a free, appropriate public education. In a very fundamental way, this war on teachers and schools is about selling off public schools to the highest corporate bidder and making a quality education a privilege not a right. Thanks to Senators Molly Baumgardner (R-Louisburg), Pat Pettey (D-Kansas City) and Tom Holland (D-Baldwin City), the bill was significantly amended. As it is now, elections would be held once every three years with 1/3 of districts each year. Also, the vote needs to be 50% + 1 of votes cast; representation would stay in place if the DOL failed to hold the election, and voting would be allowed for 14 days not just 7. Amendments that failed would have dropped the requirement that teachers pay for these elections and moved the elections from the spring to the fall. 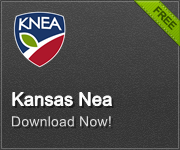 While the amended version is better than a “poke in the eye” (to quote Sen. Ralph Ostmeyer [R-Grinnell]), it is still unnecessary and is opposed by KNEA, KASB, USA/Kansas, and KSSA. The only supporters are the Kansas Policy Institute, Americans for Prosperity, and the Kansas Chamber each a Koch/ALEC backed organization seeking to dismantle public education. The bill was brought up for emergency final action (EFA). Usually final action votes take place the next day but at this time of year, EFA is not unusual. The bill was passed on a vote of 22-18. Given the conservative nature of the Kansas Senate, this is a good vote count despite the loss. Your job tonight is to thank those 18 Senators who stood up for Kansas teachers and supported the education community (KASB, KNEA, KSSA, and USA/Kansas) over the anti-education establishment in the KPI, the KCC, AFP, and ALEC. While Molly Baumgardner voted YES on the final bill, she was instrumental in offering amendments and getting them approved. She needs our thanks for our help in making this bill better if still offensive. With the first equity bill in the House not making it out of Committee and the first one in the Senate having been referred back to Committee, two new bills were introduced today to address the issue. HB 2740 and SB 515 appear to be identical. The Ways and Means Committee and the Appropriations Committee both met yesterday and again today to review the bills with staff and will have hearings. We would expect quick action since this is the last week of the regular session. The bills do not use the prior formula for determination of LOB aid, creating a new formula for the determination. Neither bill sweeps the extraordinary needs fund although it is reduced by just over $2 million and sent the the Department of Education which will be expected to distribute the money appropriately. The Senate Ways and Means Committee has put their bill (SB 515) into a House bill in an attempt to speed up the process. If the Senate passed it, it would go to the House for a non-amendable vote to concur or non-concur in the changes. Should the House concur, the bill is passed. Common Core Debate Goes Off the Rails! The House had HB 2292 up for debate first thing yesterday but put it off until last. Since the bill had been amended in committee, the first thing to do in bringing it to the floor is to move to adopt the Committee’s report. On the voice vote it sounded as if the motion failed. A roll call vote was called and the motion failed on a vote of 54 to 69. This almost never happens. In fact, we can’t recall the last time it did. What it means procedurally is that the amendments made in committee are no longer part of the bill – it goes back to the form it was in before the committee amendments. In this case the bill reverted to a data privacy bill which is how it was originally introduced. The vote caused the House to temporarily stop working while they figured out what to do. Anyone who had an amendment based on the Committee’s bill would have to have the amendments redone to meet the new (old) bill. Speaker Pro-Tem Peggy Mast (R-Emporia) finally made a motion to send the bill back to committee. Chairman Highland (R-Wamego) expressed his extreme frustration at the move, saying that they have been talking about this for two years. Rep. Ed Trimmer (D-Winfield) shared the mysterious procedure that was used this year to get this bill to this point including the “history of education presentation” and the fact that the committee bill was based on a conceptual amendment that no one saw finally until yesterday. The Mast motion to send the bill back to committee failed on a vote of 19 to 103 meaning the House now had the bill as introduced to debate – the student data privacy bill. There was then a motion to reconsider the vote to adopt the committee report which passed. Grosserode came to the well to suggest that if the House did not adopt the report, the anti-common core zealots would tie up the floor with amendments. The House adopted the committee report. The first amendment to the committee report came from Rep. McPherson, requiring any standards to be based on Rose standards. The amendment passed. Next came a massive amendment by Rep. Houser that removed the Grosserode Committee amendment, taking the bill back to the worst form and then changing all kinds of standards in an attempt to protect AP, IB and other programs. Part of his amendment even replaced some standards with Massachusetts standards! Houser’s amendment failed and the debate went on…and on…and on. One amendment adopted was by Rep. Hedke. It allowed the common core to continue to be used for AP and IB programs but ban it for all other programs. Essentially they permit using common core for high achieving students, others have no common core. The debate finally came to an end and the bill was subjected to a roll call vote. It failed on a vote of 44 to 78; a solid defeat.